So I went to the preferences pane to see what was going on. 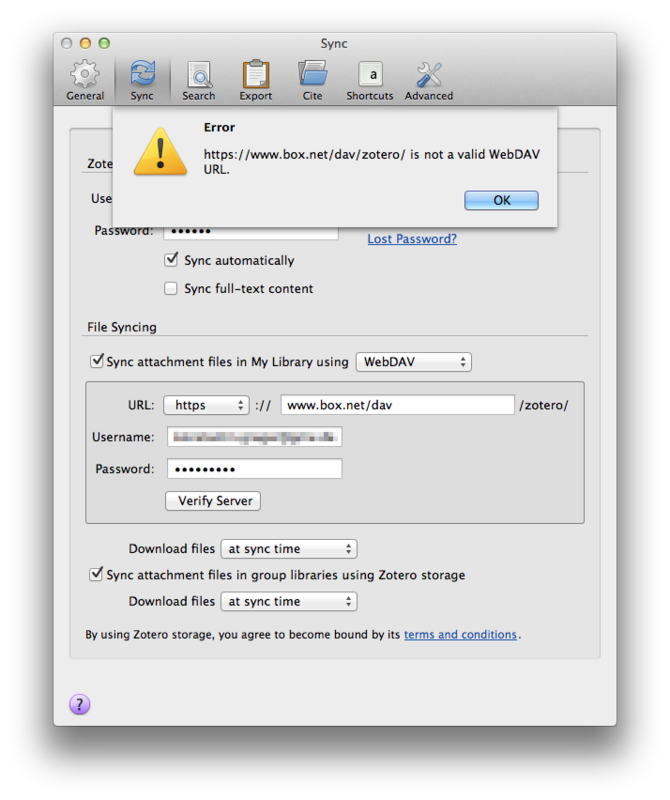 The “Sync” page provides a very handy button to verify the server information entered and check the connection to the WebDAV server. 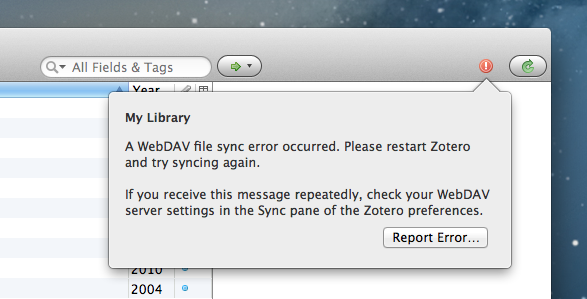 Obviously something wasn’t right here, Zotero couldn’t connect to the folder on box.net anymore. I remembered that back in 2011 I consulted the box.net knowledge base to find out what I had to enter here. While I never changed that information, something was obviously broken. I consulted said knowledge base again, only to find out that the connection parameters had indeed changed in the meantime! Apparently the company had decided to drop the .net TLD and resort to .com instead. I remember vividly that the name of the service had originally been “box.net“, but now they just call themselves “Box”. In addition the hostname now has to be dav instead of www – this one actually makes sense, since we’re talking WebDAV here, not web hosting. Entering the new server URL actually solved the connection issue. Since I don’t know exactly how long this red exclamation mark had been there, I’m not sure if the two things are related, but I recently updated the Box app on my iOS devices. I mention this here because this update also comes with a nice additional freebie: it upgrades your personal account to 50GB of storage! That’s not just very generous but outright amazing! The offer ends on February 14, 2014, so make sure you upgrade by then. Oh, and I’m in no way affiliated with Box and thereby don’t earn a Yen, cent, penny, or Bitcoin if you do that.